Look beyond Chai Jing’s film. In a time when opinion leaders, known as the “big verified accounts” or Big Vs, in China have been razed or driven away, who would have thought that one of them would re-activate the topic of smog with an eye-opening combination of a TED-like presentation and documentary interviews. Everything about Chai Jing’s film Under the Dome, from millions of views within two days, to the heated national debate, from the government’s initial encouragement to its subsequent censorship, indicates that it is a carefully-planned New Media event, and its purpose is to cause a small tsunami in the traditional arena of politics in order to establish a new framework for the politics of dealing with pollution. For now, let’s leave alone the dramatic reverse of the Party’s propaganda department. More likely than not, its shutting down the film is due to the party’s fear of losing control over the boisterous online chattering. Let’s also refrain from speculating on Chai Jing’s motivation. She explains it away as her “private grievance against smog,” which is a sentimental, apolitical pretense that Big Vs like to sport these days when speaking to the public, but few would take it at face value. On the other hand, the film will effectively mobilize the public if everyone becomes aware of his or her self-interest in all of this. The question then is: who is directing this mobilization? My focus is not on Chai Jing’s role, whether she’s addressing a personal concern or acting as someone’s white gloves. Instead, let’s read into the film and identify the forces that drive China’s politics of smog. The first force comes from the U. S. When Xi Jinping talked about blue sky during the APEC meeting last November, we should have known that the short-lived APEC Blue would turn out to mean a lot. President Obama and President Xi Jinping reached a deal in which China promised to reduce carbon emission by 20% by 2030. The deal was almost the sole instance of progress the Obama administration has made in the US-China relation at a time when the relationship is becoming more difficult. During the Clinton administration, the Most Favored Nation Trade Status was the issue that bound the relationship. During the Bush administration, the bond was war on terrorism. Now that these bonds have gone, the emission promise is becoming the new bond that keeps the two countries in a cooperative relationship in which they clash often but not break up. The deal is also one of the few gestures China makes to the United States and to the world that it is a responsible power and that it recognizes the international rules. Furthermore, smog is not just an internal affair of China. Carbon emission is a menace to the atmosphere and has long been a global issue, and the Chinese government can ill afford not to address the international concerns. In fact, it was the U. S. embassy that had popularized the concept of PM2.5 in China. As another conservative country in the UN Climate Change Conference, the U. S. needs to work with China, an even more conservative country in the Conference. 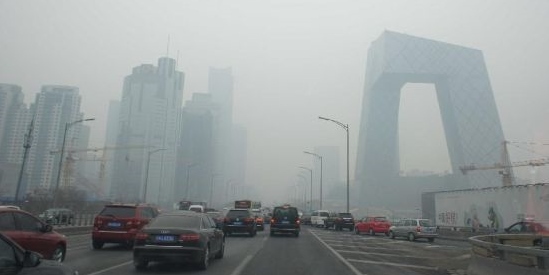 Smog therefore is a shared strategic topic for both countries, and it serves the political agenda of China’s new leaders. But of course they do not want to draw attention to the American factor of it. Instead, it is portrayed as President Xi’s concern for blue sky and as a part of his China Dream narrative. I’m sure Chai Jing’s team had a clear grasp of this opportunity, or, they might even have received hints as well as funding for the film. If so, the film is not a conspiracy as many suggested; rather, it is an explicit plan. The second force is the collapse of the coal and oil alliance in China. In the early 20th century, Germany had an important conservative force known as the alliance of steel and rye. “Steel” refers to the steel monopoly led by the Krupp family, “rye” refers to the Prussian Junker landowners, and the alliance led to militarism and the rise of the Nazi party. Over the last decade or so, there existed in China a similar political alliance – the alliance of coal and petroleum, that has supplied most of China’s fuel. “Coal,” represented by the so-called “West-hill” faction (西山派), consisted of powerful officials and big coal mine owners in Shanxi, the coal-rich province. “Oil” is represented by executives of China National Petroleum Corporation, the biggest of the three large state-owned petroleum companies, and the party’s “politics and law” system controlled by Zhou Yongkang, the party’s former chairman of Politics and Law Committee, and his network of oil industry officials. The two interest groups were formed during Jiang Zemin’s rein, a time marked by those in power making money quietly. They completed their slicing of the pie during the decade of “collective leadership” of the Politburo, and formed a political alliance to compete for the supreme leadership in China. But in 2014, they were politically struck down one after another. Of course the price drop in coal and oil diminished the profit, on which these two interest groups depended, lending a helping hand to the new leaders, so did the international pressure on China to deal with air pollution, the internal struggle, and the need to grow clean energy industries. Only now are Big Vs like Chai Jing able to raise direct questions about these groups, in what feels like a trial on Ling Jihua and Zhou Yongkang without their presence. Compared to the struggle to deal with “Tieben” (铁本) during Wen Jiabao’ time in 2004, the new leaders have been impressive. What remains, such as the zombie steel industry in Hebei, if the government could shut it down for a month during the APEC, it’s only a matter of time before it will be bankrupt. Everything will have to be subjected to the need to have blue sky in the so-called Beijing-Tianjin-Hebei economic region. This is the small “domestic climate” of the smog era, while new energy in the developed countries, the myth of shale oil, OPEC’s refusal to limit production, and the UN climate change conferences together constitute the big “international climate.” Taking into consideration the direct pressure on the Chinese fossil fuel industries from American climate change politics, the collapse of the coal-oil alliance, marked by the fall of Bo Xilai and Zhou Yongkang and their failed attempt to stage a coup, is quite like a 2014 version of Lin Biao’s escape and subsequent death before Nixon’s China visit in 1972. The third force is the power expansion of the Ministry of Environmental Protection (MEP). Throughout, the documentary gives voices to environmental protection organs, to their complaints about problems with environmental assessments, product standards and law enforcement power, etc. Chai Jing is like a spokesperson for MEP, making use of the smog to lobby her audience. If we look back at the protest against the Nu (Salween) River dam, one will have to admire the MEP. Among all of the ministry-level agencies, the MEP knows best how to leverage NGOs and Big Vs against local powers and utilize China’s environmental crisis to expand the agency’s own power, including upgrading the agency from bureau level to ministry level. What we can expect next is the further expansion of the MEP. It is not bad in itself. New power will rise as coal-oil alliance falls. We can expect the increased binding power of environmental impact assessments, and the MEP being given decisive power in setting product standards and emission standards. It is also possible that the MEP will be given law enforcement authority for the first time, for example, the authority of forced inspection, search, sequestration, fines, recall and closure. We shouldn’t be surprised if in the future the MEP establishes its own environmental police force and environmental procureratorate, similar to the Bureau of Alcohol, Tobacco, Firearms and Explosives in the United States, that merges the existing forest police force and fisheries regulatory body to form a new environmental law enforcement power. After all, the power redistribution and institutional reconstruction these changes bring is in line with the increasing trend of power concentration since Xi Jinping took power. It can also be put under the banner of “comprehensively deepening reform,” providing Chinese leaders with concrete evidence to show to the world that China is taking measures to reduce emission. The fourth force is the public. The phrase “breathing the same air, sharing the same destiny” is effective social mobilization and can unleash the potential of a large scale environmental movement. Back in 2013 when northern China was cloaked in smog for extended periods of time, people felt compelled to do something. They had never felt so viscerally and so acutely, as they did during those days as their cities were shrouded in smog, the incompetence of the government, the anti-societal nature of capital monopoly, and the detrimental impact of China’s growth model on nature. The public’s environmental awareness has never been as strong as it is today. When facing repression, people may choose to remain silent about the smog problem or simply emigrate, but their discontent can manifest in other ways and can accumulate to become a time bomb for the Party-state. As face masks people wear everyday render surveillance cameras meaningless, the security organs are said to be very uneasy, fearing that the situation can spin out of control and lead to a smog revolution. The numbers vary, but it must have taken the censorship apparatus by surprise when at least 30 million people watched the documentary and shared their opinions in the first hours of its premiering. This was almost an inconceivable happening, given the constrained state of the internet in China following “cleanups” against Big Vs. I tend to believe that Chai Jing’s documentary is a product of Xi Jinping’s “blue sky policy” and his New Media tactics, and that the propaganda department’s censorship is a cool-off decision to prevent further agitation of public opinion. It is the people who gave the film momentum and whom the propaganda department fears the most. Therefore, people are the most powerful actors in the politics of smog. As the main constituents of Xi Jinping’s blueprint for a “moderately prosperous society,” they could be trained to adhere to traditional cultural norms and appeased by the promise of blue sky. But they have potentials; many opportunities exist when they can wake up, turning from passive viewers to the main player of the politics of smog, making their voices heard, and tearing open the illusion that they are living in a comfortable and prosperous society. These four forces, the international pressure, the outgoing coal-oil alliance, the ambitious technocrats in the MEP and the state reform organs, and the hitherto dormant citizens, are the four main roles in China’s politics of smog. Big Vs like Chai Jing are merely the agents of one or two forces. They themselves are not important. What is important is the timing and the framework. Therefore, there is no better timing than 2015. The coal-oil alliance has gone bankrupt and can be made the chief culprit of the smog. And Xi Jinping’s “four comprehensives” (comprehensively build a moderately prosperous society, comprehensively deepen reform, comprehensively govern the country according to the law, and comprehensively apply strictness in governing the party) provides a good framework. The four forces appeared in Chai Jing’s documentary as the protagonist, the antagonist and the people it appeals to, each corresponding to an aspect of Xi’s governing framework, although the role of the U.S. and the international community is deliberately downplayed and citizens’ actions de-politicized. Regardless, we have to admire the film’s accurate presentation of China’s politics of smog. Wu Qiang (吴强) is a political science professor at Tsinghua University. Under the China Dome – A Reality Check, by Yaxue Cao, March 9, 2015. Smog as a Political Analogy, by Chang Ping, March 4, 2015. An abbreviated version of the Chinese original was posted here. China’s left foot wants to go north, and China’s right foot wants to go south. Both feet have the same goal, and, that is, to maintain the one-party rule. But instantly, I had other thoughts, too, just like many others did: without the government’s acquiescence or even assistance, a private citizen, even a celebrity citizen, could not have completed the investigation in which she was able to interview government officials of various positions, make inquiries with the National People’s Congress (NPC), and follow the police during their enforcement tours. In China, the government controls who can, and who cannot, expose its failings, what can and cannot be exposed. And without an order from some office, it’s practically impossible to premier the film on the People’s Daily website and disseminate it on all internet portals under the 24/7 watch of the censors. Regardless, I think the making and dissemination of the film is a landmark event. I agree with Ian Johnson’s assessment that the film is “the final proof that the Party is serious about the issue,” but the party has other determinations too. The film galvanized public opinion and consolidated its awareness to an unprecedented level. It peeled apart the multi-faceted causes of pollution. It is a mobilization of the public, and it sets expectations for a war against environmental disasters. The film works on many layers of the public psyche, and not all of them are welcomed by the government. This probably explains why it was spectacularly promoted and then shut down. “In order to solve the environmental problem in China,” said Wang Yuesi (王跃思), an atmospheric scientist at China Academy of Sciences, “first, we need to have better management. Second, we still need to have better management. Third, we still need to have better management.” Though not an expert, I’m going to take a quick look at management, management, and management. Most people are probably impressed by the government officials and researchers who spoke on camera. They are insightful about the causes of environmental ills and candid about solutions. With one zero after another, Chai Jing gives us shocking account of how laws and regulations have not been enforced. As outsiders, we are shocked that China’s petroleum standards are set by the industry itself, and the environmental authority didn’t even have a vote. Chai Jing talked about how the EU, Canada, Australia, Mexico, South Korea and Japan formulate their respective standards, how it is a result of multilateral participation, consultation and voting. But she didn’t point out what these six political systems have in common: they are all democracies in which each participating party has independent power safeguarded by the rule of law, and the powers check each other to reach optimal solutions through procedures established in similar manners. Chai Jing’s film seems to share this ideal of governance. But does the Communist Party share it? We can foresee that China will be improving its policy making process, the environmental authority probably will get its vote on the Standard Committee, but ultimately everything will still be subjected to the will and need of the party, whatever that may be at a given point. Unlike Article 53 of the Law of the Peoples Republic of China on the Prevention and Control of Atmospheric Pollution, most of the Chinese environmental laws do specify enforcement authorities. The truck stopped by enforcement officers has a certificate, issued by environmental authorities in Hebei province, for meeting the national emission phase III standard, but in reality it has no emission measure. On camera, the officer squirms, telling Chai Jing that he can’t fine this truck because it is delivering the city’s essential supplies – eggs, milk and cooking oil. Here you witness a case in which an administrative order overrides the law. It is common in China. In my favorite section of the film, Li Kunsheng, Beijing’s environmental official in charge of emission regulations, said that Chinese automakers, against the law, falsify data and that 90% of the vehicles don’t have basic emission controls. Individual automaker’s argue that they can’t afford to manufacture vehicles with proper emission controls if all of their competitors are omitting them. In addition, they argue, without gasoline supplies that meet a national standard, what’s the use of making cars that use cleaner gas? The Chinese petroleum industry does not produce high-grade gas because the industry itself is in charge of setting the standard, and being a monopoly, it is not inclined to upgrade gasoline. It sounds like the left brain and the right brain of the party are punching each other, doesn’t it? Try to put this mindset in the communist party in China. This is more or less how the Party approaches international competition, judging from the trend of the last couple of years: when I don’t know how to do it, I welcome you to come and show me how. When I’ve learned how to do it, you can’t make money from my market anymore. The ongoing Two Sessions is signaling that the environmental industry will play a big part in China’s economic transition and drive new growth. The British Energy and Climate Change Minister Edward Davey told Chai Jing that “You must give the emerging industry a fair chance at competition. If you do, it will surprise you.” The irony is, while the petroleum industry is a state monopoly and monopoly had led to rampant environmental abuses, the rising environmental industry will most certainly be a state monopoly too and a new playground for those in power. You will be lucky if it does not turn into the new toy of powerful clans like the petroleum industry is to the Zhou Yongkang clan and the power industry to the Li Peng clan. We have yet to see whether Xi Jinping’s anti-graft campaign will clamp down the tigers, but we can be certain that there will be flies everywhere. 1) Citizen watchdog. Download apps, take photos, call 12369 to report pollution, or expose it on Weibo. Chai Jing says, while reporting SARS ten years ago, she realized how important it is to have information transparency. But information transparency is not limited to emission numbers on an app. How do you have information transparency when information is monopolized by the government, media is not independent, and citizens cannot express themselves freely? In other words, the victims cannot sue; only this organization connected with the government may sue. Why don’t I just call this law a fake law? The new Environmental Protection Law of PRC, which took effect on January 1, 2015, stipulates that social organizations specializing in environmental protection and public interest activities for five consecutive years or more and having no law violation records may file litigation with the courts. There are 700 NGOs that meet the criteria, but the problem is, most of these NGOs, like ACEF, are either trade associations under de facto leadership of the government or NGOs funded by the government. To expect them to represent the victims by suing the polluters, that often are SOEs, is tantamount to climbing a tree to catch fish (缘木求鱼). In a country where citizens are forbidden to exercise their basic political rights and civil rights, where they mostly don’t even have the right to sue when their interests are damaged, how do we even talk about the right to know, the right to participate, and the right to legal relief? Chinese citizens not only do not elect their “people’s representatives,” they don’t even know which of the 3,000 representatives convening in the Great Hall of People represent them. Lawyer Liu Xiaoyuan said that, ever since 2007, he has been asking the NPC to publicize contact information of the representatives, and he has gone nowhere with his Quixotic quest. In China 90% of vehicles have fake emission certificates. So what? The people’s representatives are 100% fake. Remember that fellow, the head of the Environmental Protection Department of Shanxi province? “The cat,” he said, “is the local government’s cat. Whether this cat can catch mice or not, how many mice it can catch, is decided by the local government. It’s not decided by the environmental protection authority.” The same is true on the national level, and the state-sponsored NGOs are additional cats of the government. China’s left foot wants to go north, and China’s right foot wants to go south. Both feet have the same goal, and, that is, to maintain the CCP’s one-party rule. The journey of Chai Jing’s documentary is a microcosm of the party’s own embattled state. It was premiered by the party’s mouthpiece, but at the same time, the party’s propaganda department was keeping vigilant. Its first edict said, “All media outlets are required not to hype Under the Dome, and must control and adjust online opinion.” “Control and adjust” reminded me of a switch that can be turned on or off, dimming the brightness at will. The blinding light beam of the film was dimmed down to a kerosene lamp in less than 48 hours and then turned off completely. The party’s control is a must; the party’s will is absolute. It is so for the film, and it is so for everything in China. Don’t be surprised if the party launches a smear campaign against Chai Jing tomorrow. I don’t know whether you saw it or not – there is a thin smog over Under the Dome. Chai Jing the narrator assumes that this system is just like any other system in the world except things are not done right. She runs to the United States and to England, to shoot and ask questions, presenting their practices and successes and lamenting that China isn’t doing the same. She pretends Weibo is a place for free speech. She looks up at the blue planet, anticipating the system reform prescribed by a high-level official. She tallies all the sources of pollution except the biggest one. It is the same with those officials in the film. They are able to trace pollution to the energy monopoly, but they see no ills in the political monopoly. It’s not that they don’t see, of course. They are feigning they don’t see. Or they will be in prison or sent packing. But as everyone pretends, what’s the difference between their feigning and the faking of vehicle emission certificates? If the Global Times’ political smog index is 800 and People’s Daily and Xinhua’s 600, I say, Under the Dome has a reading of 200. When I shared these thoughts on Twitter, a Chinese tweep argued with me. “As an ordinary citizen,” he (or she) said, “I drive less, develop green habits, do my share, and have peace of mind, that’s better than doing nothing.” I said to him (or her), the film no doubt is a milestone, a powerful bugle call, for the simple reasons that two hundred millions of Chinese have watched it, and that even though the party is able to spirit it away, it cannot efface, with a click of the delete key, the smog cloaking China and the pollution scarring the land. Citizens should do everything they can, I said, to contribute to a better environment, but what they can do is purposefully restricted by the system, and they must understand that the political blue sky is the real blue sky, the ultimate dome over China. Yaxue Cao is the editor of this website. 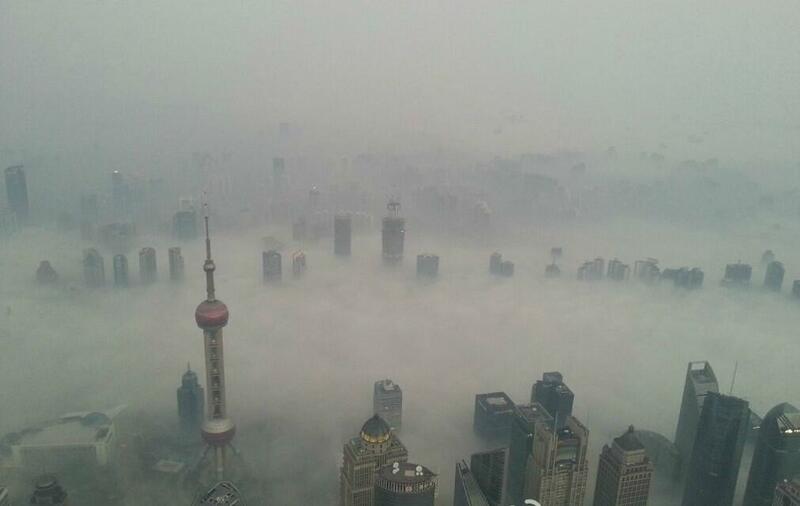 Beijing on February 21, 2014. Online photo from ScienceNet.cn. It was unusually cold at the beginning of 2013. All of China was enveloped in smog that would not dissipate. Finally, from north to south, people eagerly began to discuss the problems of pollution and climate change. Weibo and blogs were flooded daily with this topic, and the traditional media followed up with in-depth reports. Even academics, detached most of the time from real world issues, crossed the boundaries of academic fields to make appeals one after another, calling for the improvement of the environment with political system reform as the starting point. While winter lingered and it was almost impossible to breathe, it seemed as if the spring of an environmental movement was almost upon us. These circumstances are similar to 1962, when the American environmental movement reached a turning point. That year, Silent Spring was published, written by the female biologist Rachel Carson. Together with her serialized article printed a bit earlier in The New Yorker, it directly pointed out the harm caused by the once widely used insecticide DDT, and harshly criticized environmentally harmful chemical magnates and other interest groups. This sparked huge controversy in America, and ushered in a tempestuous environmental movement. In China, after discovering how a fertilizer plant polluted water sources in Shacheng in 1973, the country also stopped the production of DDT, not too far behind the international trend, it seemed. However, looking back at the last 20 to 30 years, the harm done to the environment by rapid industrialization across the country is painstakingly obvious. Environmental NGOs have developed vigorously, and anti-pollution mass protests have occurred in many places. In recent years in particular, there have been a succession of spontaneous, large-scale anti-pollution NIMBY movements, such as the anti-PX incidents in Xiamen (厦门) and Dalian (大连), the protests against molybdenum mines in Shifang, Sichuan (四川什邡), the protests against wastewater discharge in Qidong, Jiangsu (江苏启东), etc. Their scope and intensity have even exceeded the more frequent movements against violent home demolitions. But overall, they have not developed into a full-fledged environmental movement. The people of various regions across China are often each fighting their own battles, their grievances focusing on issues with the environmental evaluation of newly-proposed projects without enough vigilant awareness of industrial waste already existing in industries, soil and river pollution, geological changes, climate change, etc. As a result, they are unlikely to stop the overall trend of environmental degradation in a fundamental way. We must then examine the problems that exist in these isolated movements. It is important to do so in order to remobilize the environmental movement. First, the environmental deterioration in China is related to a series of arrangements in the administrative system between the central and local governments. This system has become extremely ridged and greedy over the past ten years, and because of this, the past decade has also been the most environmentally destructive decade China has ever seen. On the surface, it is true that such degradation can be blamed on local governments indulging in high-pollution manufacturing, or even attracting investment by polluting industries in pursuit of GDP, while the so-called clearing up and rectification [of such industries] is often no more than symbolic fines, symbolic production stoppages, or at most relocation. The reality is, under the impetus of the central finance system and the performance evaluation system for government officials, local governments and industries lack the drive to rein in pollution. In other words, the root of weak environmental policy lies in local governments that do not have to be responsible to the local people, a lack of horizontal accountability, and a central government that often uses manipulation and finesse between behind-the-scenes influence and overt controls to benefit itself at the expense of the local governments and the public. Second, an independent judiciary and fair markets are the fundamental prerequisites for an environmental movement to unfold. In the past ten years, although the Property Rights Law was passed, private property owners are still unable to obtain effective protection. It is difficult for private property owners or environmentalists to resist pollution by asserting their property rights, or to make claims and demand compensation for rights infringement by polluters. The issue of private property has been debated non-stop ever since the economic opening and reform began. As long as this issue is not dealt with, not included in the civil code, and not recognized by the Constitution and safeguarded by an independent judicial system, it will be difficult to curb environmental pollution from the approach of civil law, and the environmental movement will not be able to take root and grow strong. Third, the biggest sources of pollution, for example, industries that produce, process, and use fossil fuels, including China National Petroleum Corporation (CNPC), Sinopec, major coal producing provinces and industries, coal-fired power plants, the automotive industry, etc., have already formed strong interest groups. They respond negatively to reducing runoff and preventing pollution, but are confronted with few effective challenges. In the face of these interest groups, it is often only possible for organized civil society, such as environmental groups, media, and social movements, to have a chance at confrontation. The small minority of victims who file lawsuits based on rights violations are as futile as someone asking a tiger for its skin. Shanghai in late 2013. Online photo. Unfortunately, the vast majority of environmental NGOs that have sprung up since the mid-1990s have chosen to cooperate with the government over the past decade or so. They have avoided conflict and avoided being drawn into any social movements. They have even avoided consciously promoting the development of environmental movements. Their choice of course can be attributed to the government restrictions on NGOs and environmental issues; cooperation is their only political opportunity. For example, in the anti-hydroelectricity activities in Nujiang (怒江), cooperation between environmental groups and the central government for a time won them a victory in the resistance against the local government and interest groups. However, in the long run, it is very difficult for such limited, “disposable” cooperation to yield results. The conservative approach of environmental NGOs, in the end, has lost them the opportunity to mobilize the public. In an authoritarian age where stability maintenance is paramount, environmental groups have been placed on the radar of stability maintenance in many places as a foremost source of potential troublemakers because environmental issues involve interest groups, local governments, and an unsatisfied public. Many environmental activists have already suffered persecution and been imprisoned. Many methods of activism that were once effective, like policy lobbying, rights violation lawsuits, and environmental education, now seem to be facing high levels of risk. To the public, environmental issues, just like any other social problem, cannot be understood by simple observation or direct experience. Take the global warming problem for example. It is usually difficult for the average person to understand that the current severe winter is actually the result of global warming due to the correlation of Arctic Oscillation and the oscillation of the positive and negative changes in the Atlantic and Pacific Oceans. The public’s indifference to pollution around them represents their typical level of environmental awareness. It is only when facing common experiences on a large scale, like heavy and lasting smog or a severe winter, that the public can finally begin to think seriously about the environment. When the age of smog was upon us, we saw that those who spoke out first and exerted impact on the public as well as the government were not environmental organizations, but activists of China’s current social movement, namely, online opinion leaders and the large numbers of ordinary social media users. Just as the real protesters during the Southern Weekend incident were in fact some Twitter users and average residents who carried out demonstration for several days on end outside of the building at No. 289 Guangzhou Avenue. In the age of smog, the mover of the environmental movement as well as its future development perhaps will not be the environmental NGOs that have forsaken opportunities and become conservatives, but rather the average citizens and participants in social movements other than the environmental movement. In this respect, they are quite similar to the environmental movements of North America and Europe. The hand-in-hand development of an environmental movement and an extra-party movement in Taiwan in the 1980s is also very inspirational to us. 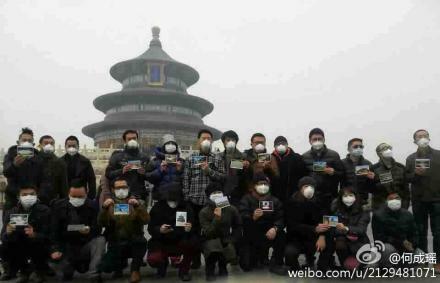 A group of Beijing artists protested against toxic smog on February 24, 2014. For example, in the development of environmental movements in Europe, politically conservative ecological groups, like The Club of Rome and the Audubon Society, admittedly played their roles, but to a large degree, these movements benefited from the contributions of radical social movements. With the mobilization of Anti-Vietnam War protesters, an entire generation of European scholars and youth became involved in a sweeping social movement, demanding that materialistic development and the control of national welfare systems over society be changed. In the 1970s, this movement evolved into a new social movement of which the environmental movement was the main part. It can be traced back to late 1950s Germany, flourishing in the 1968 student movements in Germany and France before converging with ecologism. After the student movements in the early 1970s dissipated, they were gradually transformed into various new social movements, such as the feminist movement, the gay rights movement, and environmental movements that included the anti-nuclear movement. Environmental movements and other new social movements thus shared common networks and backgrounds from these student movements. The student movements of 1968 cultivated an entire generation of young political activists. They provided the main leaders and cadres for environmental movements later. The next step was to form parties or pass the movements onto the public. Throughout the 1980s, green parties were established in European countries. At the same time, as mainstream politics inclined towards conservatism (for example, the Thatcher government once expressed hostility towards environmental creativity) or mainstream political parties were unwilling to take up environmental issues, Europe’s environmental groups and newly established green parties continued to advocate their environmental positions to the public. This stance and method of dissemination had a far-reaching influence. Some estimate that in 1985, there were approximately 10 million western Europeans belonging to one or more environmental groups, and the number of people participating in local environmental movements was two or three times as many. By the beginning of the 1990s, the general public in Europe had totally embraced environmentalism. Even though “un-mobilization” and institutionalization appeared to have become the trend in the environmental movement, and there were fewer protests and demonstrations in comparison to the 1980s, public opinion became the most important resource of the environmental movement. The protests did not decline with the institutionalization of the movement, rather, they became the mainstream position swinging the attitudes of political parties. In China, it is possible that the age of smog will set in motion an opportunity for the masses to directly participate. While environmental organizations will still carefully evade the mobilization of the masses, it is possible that more radical public opinion leaders, rights defense activists, and average citizens will take on the role of the transducer. They will express their anger over the “Beijing cough” to the ruling class on behalf of the emerging urban middle class and transform the worries of the masses into pressure on all levels of government. 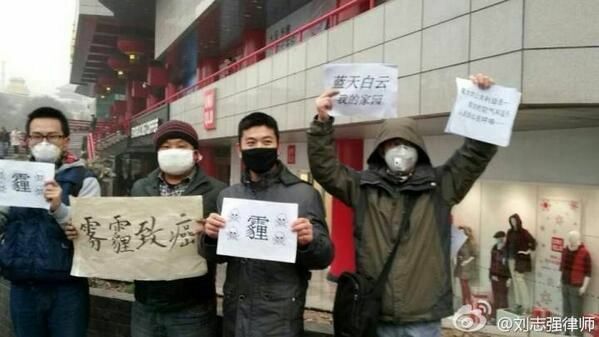 Young people protested against smog in Xi’an in 2013. Online photo. Next, for an environmental movement to expand to other domains, it will depend, to a large degree, on whether the environmental movement can truly persist. Taiwan’s experience was more politicized — the political opposition mobilized the public to participate in politics through anti-nuclear power plant and anti-pollution environmental movements. In mainland China, conditions are not ripe for doing this. But it is possible for an environmental movement to merge with another event that grips the masses. From there, it can slowly ferment, exploiting a path to mobilize society and the entire urban middle class to seek social justice. One thing that the Chinese public knows, and has put up with, is that behind environmental pollution is an economic model by the powerful and the rich, a lack of protection for private property, and excessive exploitation of natural resources. Environmental degradation also implies the inequality of social distribution, the issue of environmental justice. The greatest victims of the electronic waste pollution in Guiyu, Guangzhou (广东贵屿) were the workers processing trash. The victims of lead, zinc, and rare earth metal mines in Guizhou, Hunan, Jiangxi, and other places, are the local farmers. The main victims of smog are urban workers, the elderly, and children. Behind coal, China’s main source of energy, are the facts of the abominable production conditions for the mine workers: for every million tons of coal, there are approximately 2,000 deaths. The working class, average urban residents, and the rural poor are the direct victims of environmental pollution, the sacrificial goats of environmental injustice. They are directly damaged by pollution in every stage of production and life but have the least protections. It is difficult for them to enjoy drinking water, air, food, public sanitation, and scenery that are up to standard. They have no place to escape. The international community has continuously demanded that China step up its emission reductions, but the Chinese government has always used environmental justice as a shield to fend off such demand. Under the Xi Jinping and Li Keqiang administration’s new political promise of a “beautiful China,” however, there seems to be, all of a sudden, some legitimate elbowroom for the issue in domestic struggles. All kinds of social movement activists can take the route of environmental justice to expand the scope of the population that could be mobilized for an environmental movement, demand change to the unequal relationships of employers and employees, press for implementation of private property rights, and resist the despicable actions of interest groups. 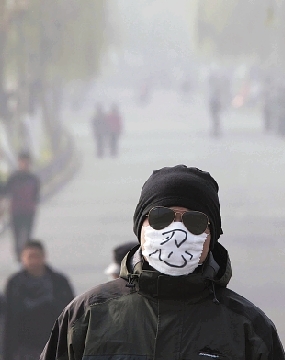 Thick smog shrouds China. While it might be difficult for people to see each other’s faces, the distance between the public and an environmental movement is becoming smaller than ever before. Dr. Wu Qiang (吴强) is a political science professor at Tsinghua University.